A new craft beer brand which will donate 100% of its profits to clean water projects is being launched. 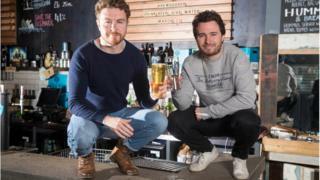 The entrepreneurs behind the Social Bite sandwich shops in Edinburgh, Glasgow and Aberdeen have teamed up with beer company BrewDog. Brewgooder's Clean Water Lager will be launched with a campaign to fund production of the first 200,000 cans on Tuesday. It will also be available on tap in BrewDog's UK bars. It aims to supply clean drinking water to one million people in the first five years due to tie-ins with Oxfam, WaterAid and MercyCorps. All profits will go to the Brewgooder Foundation, whose trustees are made up of Alan Mahon and Josh Littlejohn - the team behind the not-for-profit sandwich shop Social Bite - and BrewDog founders James Watt and Martin Dickie, supported by the Hunter Foundation. Mr Mahon said: "We're offering beer drinkers the chance to help others by doing what they love most - drinking good beer. Using beer to drive such an ambitious social change has never been tried before. "Today we are beginning a journey to provide one million people with clean drinking water and with our #DrinkBeerGiveWater crowdfund campaign, we are asking the public to help us on our mission." Mr Littlejohn said: "We wanted to build on the success of Social Bite and develop other models of using business to tackle social challenges. "There is a lovely symmetry of drinking good beer and giving clean water. "We are excited about teaming up with a business of BrewDog's scale to make a significant impact - with the ultimate ambition to make a dent in a global water crisis that means 650 million people have no access to clean drinking water and 1,400 children die each day from water-borne diseases." At Social Bite cafes customers are able to buy a drink or a meal for a homeless person to be given free of charge at a later date. Last year Social Bite offered a prize of dinner with George Clooney in Edinburgh.